Finally I had a few minutes to night to start downloading Apple’s latest OS X Lion. I started the download, and went on my merry way playing with the kiddos. An hour or so later, my phone starts dinging like mad with the email chime going off. 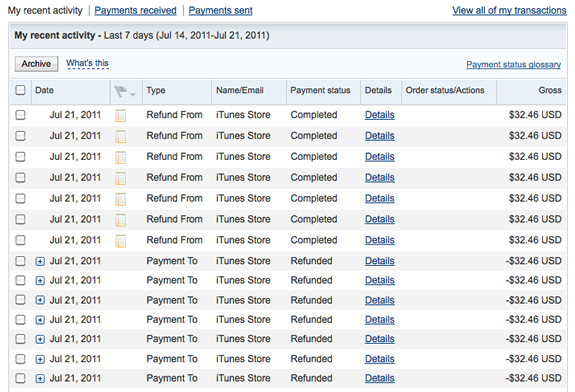 I look down to find that Paypal has charged me 7x for my Apple Lion OS X purchase! I went to Paypal.com – logged on to start the complaint process By the time I went to find my Paypal ID, I was refunded. After searching the web, some people were charged up to 15x! Apparently some weird Apple App Store glitch in regards to Paypal payments, just happy these were refunded without issue. I can then deposit it back to my account. did these post to your funding source? Mine did and now it’s taking them 2 days and I still haven’t seen the refunds post to my account. They are so quick to pull the money out but when its a refund they drag the process out. They will take the money out but then it takes about 3 working days for the Refund to post on PayPal. Once you get that, deposit it back to your account, it will take another 3 working days. I talked to PayPal and if you have the money in your account, just wait and deposit it back because banks will charge a fee for stop payment (and these are per case and if you were charged 5-10x’s, why pay for iTunes mistake). I feel for those though, who don’t have much money in their account and were charged multiple times. The worst thing is that I contacted iTunes Store through their 24-hour e-mail and they didn’t respond. No apology…hell, send me a free iTunes card for my frustration…lol…they can just acknowledge it. This is unfair to the consumer and unfortunately, we’re screwed no matter what. Sure, you get the refund but your out the money for nearly a week in your account. Read to the end of the thread to see other “glitches”. I was charged 6 times for Lion. It looks like the duplicate charges have been refunded, but still very frustrating. This experience does not build confidence in e-commerce. The problem is that it pulled from my bank account multiple times, got NSF fees, and the refunds only go back to Paypal after 3 days. So I have a list of NSF’s that I have to dispute. Enjoying this same glitch 5 days later, 13 extra charges so far. I’ve disputed all the charges and pulled my Paypal info from my Apple store account in hopes it slows down. If I see another pop I’m going to flip out. We still have 4 outstanding charges. SO frustrating! I was charged twice and was immediately refunded the extra charge. iTunes have some major billing issues anyhow, I’m still in the throes of arguing with them about the fact that they keep requesting (but happily never taking) £6.76 out of my now closed card account. it’s now late July and they’ve been doing it 30+ times a day since MARCH! they keep shouting card fraud, but the bank have told them categorically this isn’t in keeping with any card fraud they’ve ever seen and is far more likely to be an automated card billing issue. iTunes can’t track the problem down. I buy everything with a gift card now, not ideal, but it works.